Leading Better Value Care Clinical Initiatives will focus on eight shared clinical priorities across the NSW health system. 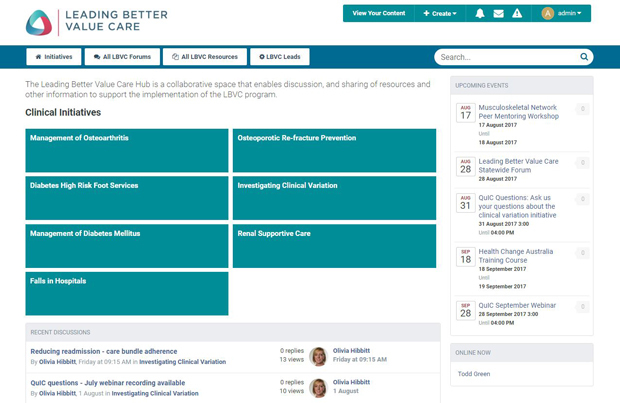 The Leading Better Value Care Hub (secure) is a collaborative space that enables frank operational discussion, the sharing of resources and in development plans as well as other information to support the implementation of the program. This section will provide support material centred on capacity, capability development and broader Leading better Value care Communications with Health teams. There continues to be more targeted information available under password protection in the secure section of the LBVC Hub. Commencing in 2017/18, the NSW Health system will refocus - away from the traditional approach of measuring value in terms of volume/output in relation to costs, to measuring value in terms of the Triple Aim of health outcomes, experience of care and efficient and effective care (in relation to costs). Healthcare is adapting to suit the changing needs and expectations of communities, patients and carers. NSW must meet the challenges of planning, funding, delivery and evaluation of services that are posed by an increased demand, an ageing population and the increased prevalence of chronic disease. The Agency for Clinical Innovation and Clinical Excellence Commission recognise that Local Health Districts and Specialty Health Networks will have questions regarding the implementation of the Leading Better Value Care Clinical Initiatives over the course of the program.